Marcel Desailly says Jose Mourinho will be “boiling” to beat his former team, Chelsea, when Manchester United host the Premier League champions-elect on Sunday, after Blues fans branded him ‘Judas’. Mourinho has lost twice at Stamford Bridge this season – 4-0 in the Premier League and 1-0 in the FA Cup quarter-final. During the second game, Chelsea supporters sang “you’re not special anymore”. The Portuguese responded by holding up three fingers, one for each title he won with the London club. Desailly, who spent six seasons at Chelsea, said: “You only have to see how Mourinho reacted the last time he went to Stamford Bridge, and his reaction towards the fans. “He will be really boiling for this game. He was very hurt by their provocation – I know this from good sources. 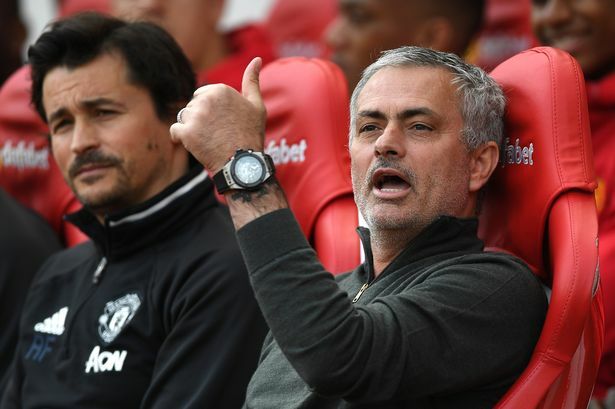 “Mourinho will want to show that his commitment to his new club is absolute, that he is still a winner, and that he can bring Manchester United to the same level he reached with Chelsea. “He has the perfect motivation – to block Chelsea from winning the title and to secure United’s path towards the Champions League next season.